Take your Puppy Kid to School! Learning for puppies begins the morning after they join your household. An eight-week-old puppy can quickly learn to sit for his food or a treat, walk on a leash without pulling, and come when called without formal classes. However, when the household is full of dogs, children and other people coming and going at all hours, the puppy will not get his critical socialization at home. We highly recommend that you seek formal socialization/obedience training for your new Kid. This will give you and your Kid a set time to train and bond without all the interruptions. Most clubs and training schools offer a Puppy Kindergarten class that fulfills two goals: helping the owner understand the puppy and exposing the puppy to the world. Puppies should not be subject to regimented lessons in these classes but should learn basic commands, play a bit with other puppies, and learn how to behave in a friendly and stimulating atmosphere. Havanese should never be manhandled. They should never have to wear a prong or a choke collar. 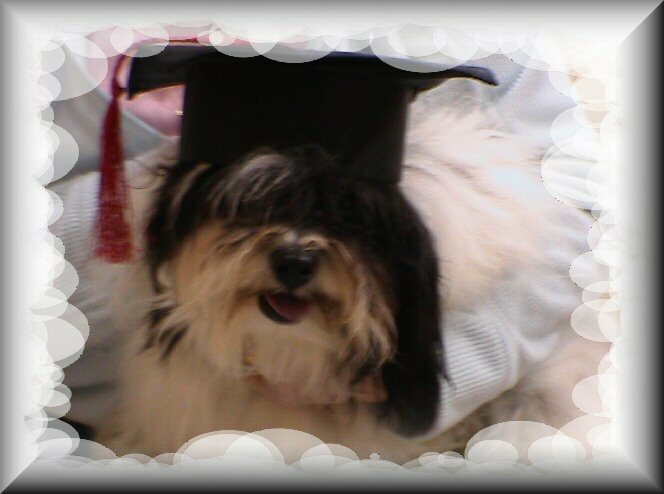 Those types of collars are for breeds that are more independent or headstrong and can actually do physical and emotional damage to a Havanese. Your Kid will do well in obedience with lots of praise, practice and positive reinforcements. Trust your instincts, if you feel uncomfortable with a training procedure, don’t do it. Training a dog relies on the principle of positive reinforcement. Positive reinforcement has proven to be the most successful in training because it is so simple, a child can do it and, it doesn’t hurt your Kid. So what is positive reinforcement? In simple terms, positive reinforcement is whenever the Kid does the desired behavior you reward your Kid with something it likes. For example, if your Kid sits, you reward him immediately with praise and/or a treat. Your Kid is more likely to repeat the behavior when asked because sitting has caused him a pleasant outcome in the past. Think of all the times you have been positively reinforced in your life--haven’t you wanted to repeat the behavior for which you were reinforced? Look for an obedience center for classes in your area. It is recommended to visit and observe at least 2 different instructors/classes before making a choice. Positive reinforcement will produce a well behaved Kid!